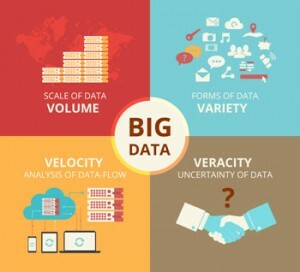 Analytics: The Big Picture | Blue Mountain Data Systems Inc.
Big data analytics are very popular right now. Google lists over 107 million results for it, and they can be retrieved in 0.29 seconds. Deciding whether to invest in analytics, however, deserves some targeted research. The distinction between structured and unstructured data is important because automated reasoning—Web 40.0—requires both kinds of data analytics. Predictive analytics especially requires both, and without the integration and analysis of unstructured data with structured data it’s impossible to comprehensively describe, explain, predict or prescribe behavior. For example, while a company might track the sales of specific products and services, and correlate structured sales data with all kinds of variables (like time of year and customer demographics), without unstructured data (like social media and call center logs) it’s impossible to fully understand why sales rise or fall: structured data analytics can describe and explain what’s happening and unstructured data analytics can explain why it’s happening. Together you get the whole picture. Nearly 80% of new data is unstructured, but it is noisy. One of the major challenges of unstructured data analytics (UDA) is finding diagnostic signals within mountains of unstructured noise. Once it’s cleaned and analyzed, must then be integrated with structured data. This can be done “manually” or with the major business intelligence (BI) platforms that companies already have in their analytics arsenals, platforms like SAS and SAP/NetWeaver, among others. For more information about seeing the big picture in analytics, see the full Forbes article.